If you have ever had money worries and, lets face it, who hasn't in these days of financial turmoil, you might like to learn a little about IVA's and how they might help you. I'll explain as simply as I can what an IVA is, summarizing the key elements. I will then list the most frequently asked questions and provide brief answers. Who knows, an IVA might be just the solution to your financial problems. At the very least, you should have a grasp of the IVA process and perhaps be able to describe it to some of your friends or colleagues whose debt problems may be a lot greater than yours. If this article whets your appetite for more information, please contact us at Debt Advice on 0800 043 5133. You have debts; you can't afford to make the agreed payments on your debts; you would like to reach an agreement with your creditors to repay what you can afford; you have regular income; you may or may not have assets such as a house; you would like the agreement with your creditors to repay some of your debts and to have the rest written off in a reasonable time period and you would like the agreement to be binding on your creditors aswell as on yourself of course. An IVA, which stands for Individual Insolvency Arrangement is a formal agreement between you and your creditors to repay a portion of your debt over a limited period - usually five years, but it can be for a shorter period too. It is also binding on all parties. See the example below. At the end of the IVA, provided you have adhered to the agreed terms, all your debts are discharged and any remaining debts are written off. What could be simpler? Well, lets answer some of the obvious questions that arise. Must I include all my debts? With the exception of secured debts such as your mortgage or your car HP, all other unsecured debts must be included in your proposal for an IVA. Credit cards, loans, current accounts, store cards, borrowings from friends or family, arrears on utility bills such as telephone, gas or electricity, self assessment tax arrears and arrears on council tax or water charges are all examples of unsecured debts. Must all my creditors agree to accept my IVA proposal? No. All your unsecured creditors have the right to vote on your proposal but in practice not all creditors exercise this right. Of those who do, more than 75% of your unsecured creditors, as measured by the value of your debts to them, must accept your proposal for an IVA to come into being. What about creditors who do not vote? They are still bound by the decision taken by the creditors who did vote. For example, if you had debts to four creditors of say £20,000, £15,000, £8,000 and £1,000 and only the £1,000 creditor voted then the other three big creditors would still be bound by the decision of the smallest creditor, which hopefully would be acceptance of your proposal. What about the IVA being binding? All accepted IVA's are registered with the government and the main legislation governing the formation and conduct of IVA's is governed by the Insolvency Act (1986). Only what you can afford. An income and expenditure statement will need to be prepared and your monthly payment will usually be the difference between your income (what you earn and any pensions and benefits) and your expenditure (your living expenses of your dependents such as your family). How long will I have to make these monthly payments? The usual duration for an IVA is five years or 60 months. However, it can be shorter than that if for example additional funds should become available. For example, if you should re-mortgage your house, with the prior agreement of your unsecured creditors, thereby releasing an equity lump sum; you can contribute some or all of this lump sum to your IVA, creditors could agree to reduce the duration of the IVA, enabling you to be debt free in a shorter period of time. What about my mortgage or car HP payments? You can continue to pay these directly to your secured creditors and they are alllowable expense items on your income and expenditure statement. What about the costs I would incur in an IVA? 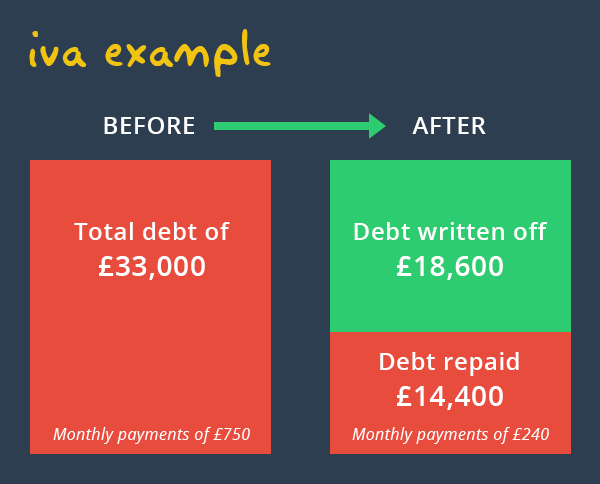 All the costs are taken from the monthly payments you make into your IVA. You have to pay nothing more yourself. Can I get an estimate of these costs? Not just an estimate. A good IVA provider will include a summary of the costs of the IVA in the proposal itself and these will usually be fixed over the duration of the IVA. So, you will know upfront what the costs of the process will be over the full duration. Where can I get advice on IVAs and what will it cost me? Debt Advice belong to McCambridge Duffy; a firm of leading chartered accountants and one of the biggest insolvency practices in the UK. All of our advice is free, confidential and without obligation. All of our approved IVAs are administered by licensed Insolvency Practitioners. We charge no fees and receive no income until your IVA is accepted by your creditors and even then, our fees come out of your monthly agreed creditor payments.If your creditors do not accept your IVA, we receive no fees whatsoever. The main alternative options usually considered by people with personal financial problems are to obtain a consolidation loan or to enter a debt management plan or to go Bankrupt. It may even be that with a little advice, we could show you how to manage your financial problems a little differently then you may not be insolvent at all and you could manage your own financial affairs yourself. How can I get advice on all of my options? The first thing you should do is contact us at Debt Advice. You can call us on 0800 043 5133 or fill in our enquiry form on this page and we will contact you to help and advise. You will need to provide us with full details of your financial circumstances (your information will NEVER be passed on to a third party) and following your consultation you will have a much clearer idea of what you can do next. We only offer the best debt advice for your circumstances and you do not have to commit to anything with us.